One interest she claimed was the husband's portion of real property which remained in both of their names. She had filed a notarized interspousal transfer deed with the County of Los Angeles, California. The deed transferred his interests to her. I was retained by the husband's counsel to determine the authenticity of the deed. The wife represented herself as plaintiff. The judge allowed me to use his courtroom during lunch break to examine the interspousal transfer deed. This meant the time permitted to perform the examination was very limited as court would reconvene after lunch, regardless whether I finished the examination. I brought a portable digital flatbed scanner and the digital microscope to capture images of the documents. Both obtain power directly from USB port on the computer. The bailiff gave me the questioned document and other deeds being challenged by the husband. There were other deeds not being challenged yet were part of the court exhibits. All documents were photocopies created with black toner. As many as possible had to be scanned within the time constraint. The documents had to be compared with each other to determine whether the challenged deed was created from one other deed. Obtaining high quality images is very important to perform a forensic document examination . Especially since I had one opportunity to examine the documents. The documents were scanned at 800 pixels per (PPI) in 24 bit color to TIFF format. The reason for scanning to TIFF format is this format retains all data. In digital imaging parlance it is called non-lossy. Other formats such as JPEG and PDF compress the data and are called lossy format. Scanning black and white documents in color is important for later examination on the computer. The color images retain more detail than black and white images. It was important to capture as much data as possible from the documents both the front and back sides of the documents were scanned. This included any possible anomalies in the paper and printed text. The file for each scanned page is approximately 175 megabytes in size. Due to time constraints, I could not image the documents using the digital microscope. Upon returning to my office, I used Adobe Photoshop CC© to examine the interspousal transfer deed in question and other documents. The objective of the examination was to determine whether the deed is an altered document or it is a legitimate document. I printed the images of each deed. A visual comparison was made among each deed. The purpose of the visual comparison was to determine whether similarities exist between or among the different deeds. Two deeds appeared to have identical attributes. These attributes included notary stamp location and the signature form and location on each. The deeds were for the same property address. Using Photoshop I changed the color of one deed from black to red then superimposed the deed onto each other. Other than the portions stamped by county recorder at the time of recording, all these attributes superimposed onto each other. The next step was to determine how one document might be created from the other. Adobe Photoshop CC provides a tool for high level of magnification of an image. Because the image was scanned at high resolution to TIFF format, I examined details of the deeds. 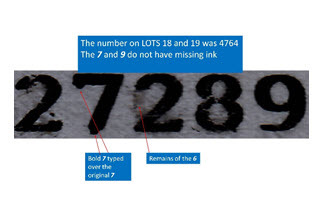 Examination of the front of the deed in the lot and track numbers revealed other numbers had been present below the existing numbers. Anomalies existed in the appearance of the existing numbers on this deed. Each deed had the number seven in the same location. The other four numbers in the deeds differed. The number on the legitimate deed contained four digits: 4764. The number on the questioned deed contained five digits: 27289. The numbers seven and nine in the questioned deed appear in solid ink. The other numbers had ink sections missing. Ink was missing in some areas because the original numbers were removed from the photocopy using a sharp instrument. This removal disturbed the paper fibers causing ink not to adhere in certain areas when the new numbers were printed on the page. Because the number seven was the same on both deeds, it was not removed. In the number seven, we can see remnants of the original seven protruding at the top left and bottom of the number seven. The number nine was added to the end of the string of numbers. Examination of the rear of another section of the document shows how the altered document was created. The rear shows protrusions resulting from removing the original numbers from the front of the document. The raised number 51 followed by a comma are readily seen in this image from the back of the document. These are the remnants of the original number 51. The number 51 was scraped from the page causing a protrusion to the rear of the page. The new number 750 is visible on the front of the page. The deed in question was created from a legitimate deed. The legitimate deed was photocopied. A sharp instrument was used to remove the relevant numbers from the front of the deed. Pressure from removal of the numbers caused damage to the paper fibers on front of the page. The pressure from the instrument caused the paper to protrude from the rear of the page where the original numbers were removed. This caused the original numbers to be visible on the rear of the document. There was ghosting of the remnants of the original numbers on the front of the page. The Court ruled the deed in question was fabricated from the legitimate deed. The husband's interest was returned to him. None of the other deeds challenged by the wife were transferred to her. Make sure your forensic document examiner knows the procedure for performing the requested examination. The forensic document examiner must think beyond the stated assignment to look for evidence that solves the case. Mike Wakshull, MS, CQE, PMP, CISA, is a forensic document examiner based in Temecula, CA. He holds a graduate school certificate in forensic document examination from East Tennessee State University and a master's degree in Technology Management from the University of Denver. 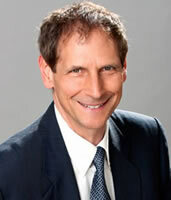 Mike is Chair of the 2012 National Association of Document Examiners Conference in San Diego.